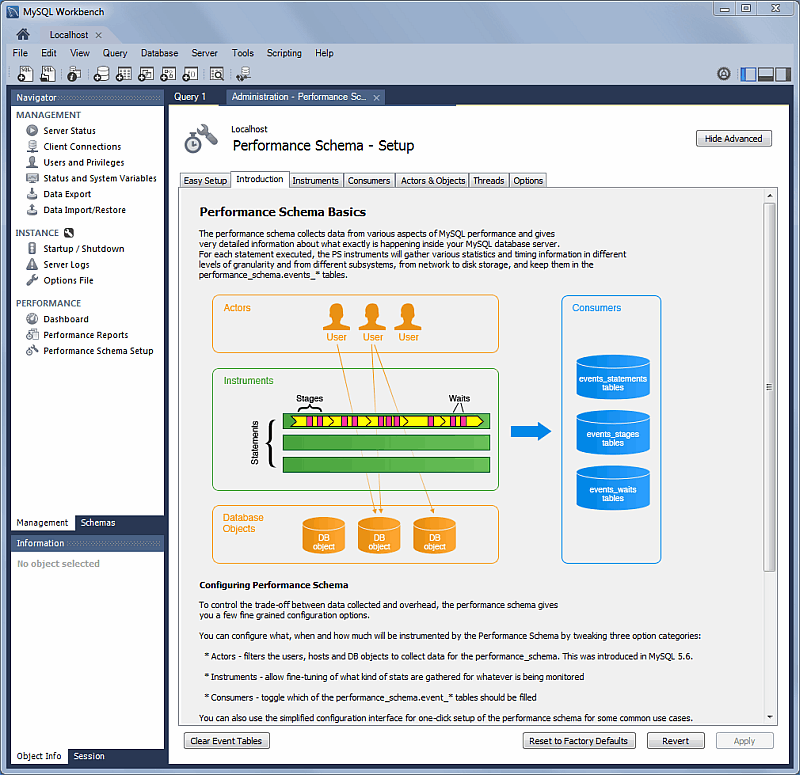 Performance schema based reports provide insight into the MySQL server operations through helpful high-level reports. 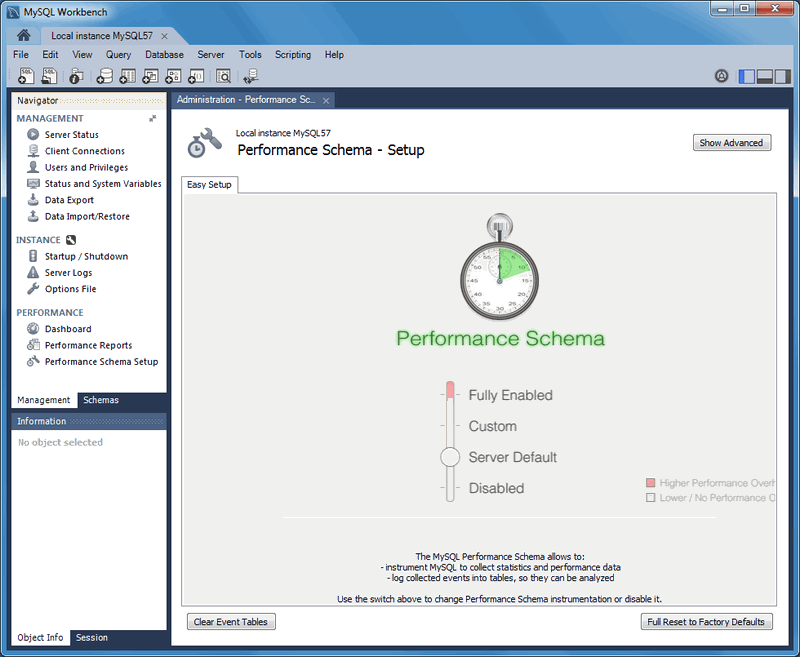 MySQL Workbench uses the SYS views on the Performance Schema to generate over 20 reports to help analyze the performance of your MySQL databases. 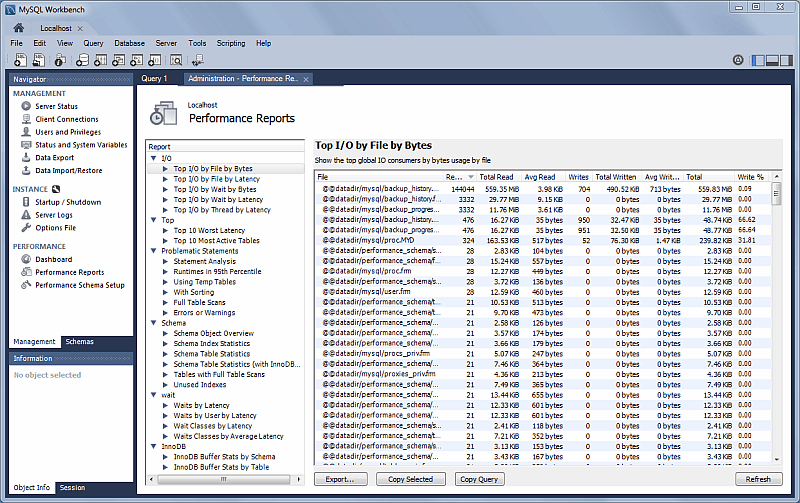 Reports help analyze IO hotspots, discover high cost SQL statements, and review wait statistics and InnoDB engine metrics. For additional information about the SYS schema, see MySQL sys Schema. A GUI for configuring and fine tuning the Performance Schema instrumentation (see the figure that follows). Initially, this loads an Easy Setup tab that is enough for most users. To enable all available Performance Schema instruments, pause your pointer device over Fully Enabled and click the circle on the slide bar. The SYS schema is bundled with MySQL Server 5.7 and above, and MySQL Workbench uses that version. However, for MySQL Server 5.6, Workbench installs its own bundled version of the SYS schema. The size of the saved digested query is determined by the MySQL server. Clicking Show Advanced provides methods to fine tune the Performance Schema instrumentation. The next figure shows the tabs related to advanced instrumentation and the Introduction tab selected. Export: Export all entries and associated data (and column headings) from the current performance report, which includes all queries and values. Opens a file dialog for export. Copy Query: Copies the SQL query that generated the performance report. Saves to the system clipboard. Refresh: Refreshes (reloads) the performance report. This can take a long time to execute on instances with a large number of objects.